Hollyhocks are one of the first flowers from my garden that amazes me each year with their fluffy heads bursting with color and their massive heights that tower over everything else growing in the yard. 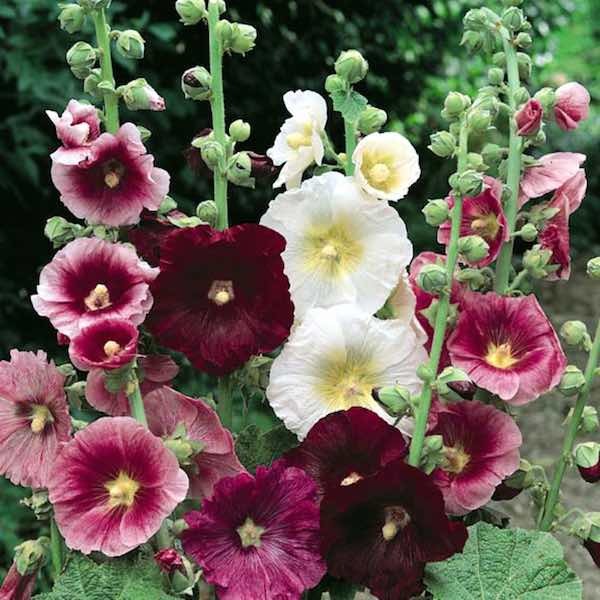 Beautifully shaped petals and mighty stalks that pull through the soil like mini tree trunks all make the hollyhock a favorite for most gardeners. There’s no wonder why this plant is associated with a majestic orientation due to its superior floral presentation and impressive ability to flourish in several conflicting soil grades. In truth, the hollyhock prefers impoverished earth to dig its roots into and will actually live a longer lifespan through the summer if the ground hasn’t been fertilized or treated. Another symbol that the flower represents is fertility and fruitfulness. During the end of its life cycle when the leaves and stem begins to droop, the hollyhock produces a round disk that encompasses many different seeds so that it can reproduce. The perennial’s ability to do this has made the plant an icon for fertility treatments offices, mothers support groups and can often be seen as the logo for baby clothing enterprises. Baby stores weren’t the only ones who used the appeal of the flower’s properties for their marketing purposes since the hollyhock was replicated over and over again in several famous Flemish oil paintings. Art Nouveau artists also had fun featuring the flower in many contemporary décor products such as the fabric for curtains and even as printed wallpaper. A third meaning for the hollyhock is tied to ambition because of the overall strength of the plant to grow in an array of conditions and its powerful presence in landscaping scenery. Quite often you can also see hollyhocks lining fences and gates because some believe that their statuesque appearance and tall lengths reflect the impression of protection and safety.